Kirby Puckett. 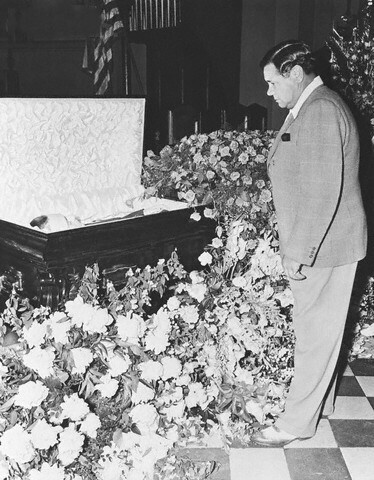 Lou Gehrig’s Funeral. Chris Sabo. 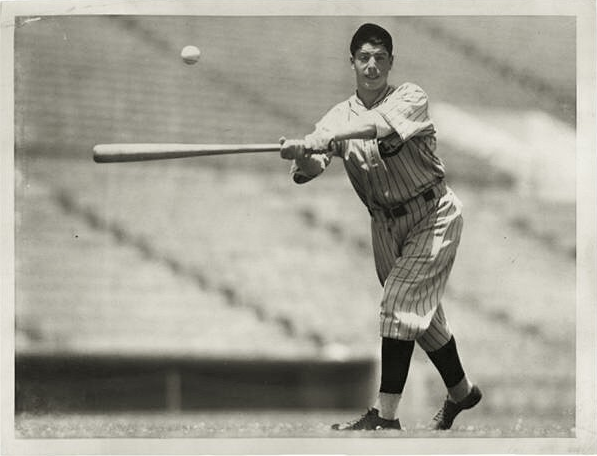 Joe DiMaggio. 1956 Brooklyn Dodgers. | ninety feet of perfection. This photo has my childhood written all over it. The 1991 World Series is one of those magical moments from my childhood which validated my growing love for the game of Baseball. 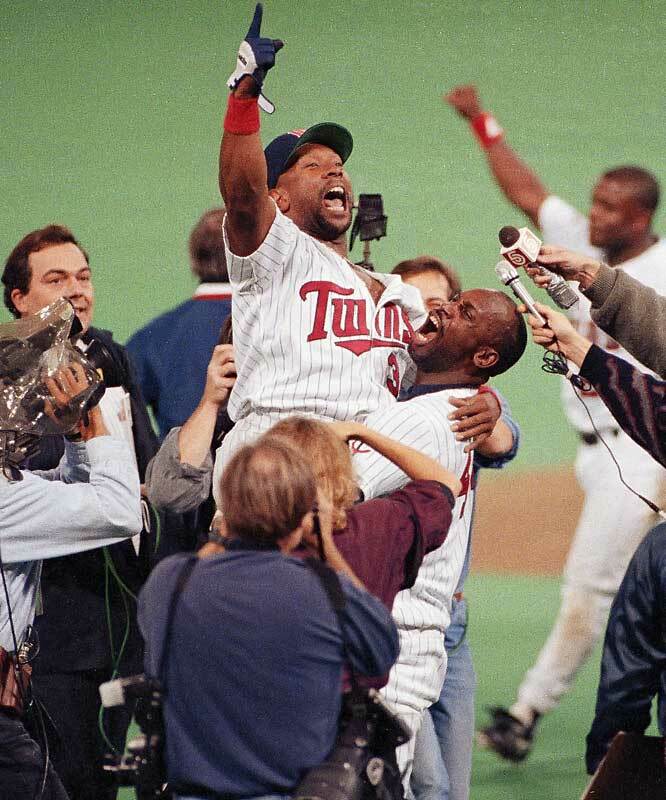 I’m quite certain I watched all 7 games of the series but what stands out the most is Kirby Puckett’s performance in Game 6 for obvious reasons. I don’t think I knew one person who did not love Kirby as he was one of those players in the late 80’s & early 90’s that every little boy seem to idolize. June 3rd, 1941. Babe Ruth says goodbye to friend and former teammate Lou Gehrig. Ruth supposedly broke down in tears during the viewing of Gehrig’s body according to “Luckiest Man: The Life and Death of Lou Gehrig.” This literally had to be moments before his emotions took over. Lately I have been incredibly fascinated with every aspect of Gehrig’s life due to “Luckiest Man.” This certainly includes his sickness and death. I apologize if this photo may be somewhat disturbing to some but it’s relevance to the history of the game is too strong be ignored and not shared. While his great years did not last nearly as long as Kirby Puckett’s, I must say that for a period of time during my childhood, Chris Sabo was one of the coolest ball players around. 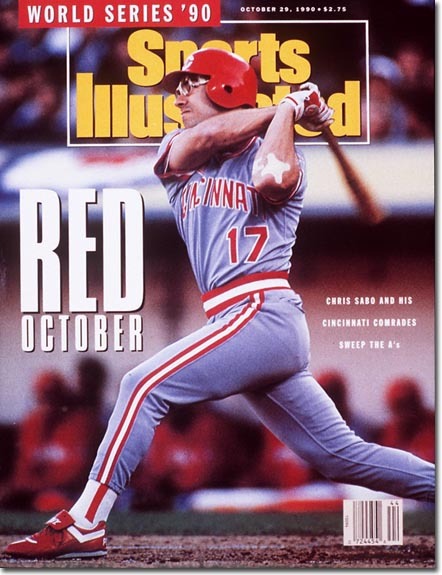 I had this issue of Sports Illustrated on my wall as a kid because it was the closest thing I could find to a Chris Sabo poster. His goggles, enthusiasm and hard-nosed play was more then enough to impress the hell out of a kid like myself. Now I could be wrong, but I swear this happened: Who else remembers when the Reds won the ’90 World Series and during celebrations on live television, Sabo dropped some f-bombs and other obscenities? If I remember correctly, his mother was interviewed at some point and she made a point to inform everyone that she “Did not teach her son to speak like that” (or something along those lines?). I know there are some Reds fans who read this blog, please tell me I am not imagining this or mixing it up with someone else! Not too much to comment on this photo. It’s just your standard awesome photo of Joe DiMaggio during his years with the San Francisco Seals. 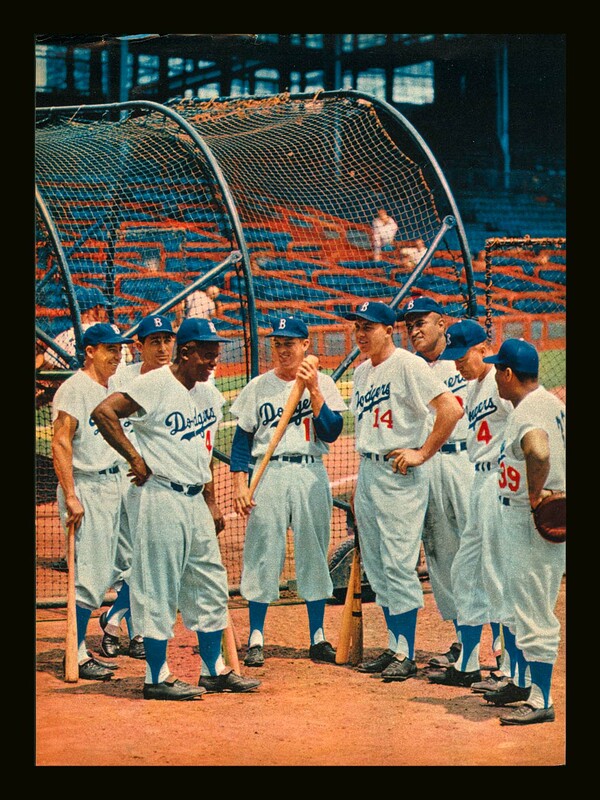 The Brooklyn Dodgers during Spring Training of 1956, still fresh from their World Series championship from Fall of 1955. Everything about this photo is pretty much perfect in every way possible. ~ by duaneharris19 on December 7, 2011. Duane: does that Gehrig book get into the recent concussion theories? Also, Powder blue reds unis? Thank god punk rock saved me from late 80s early 90s baseball fashion. Ed, no it does not get into concussions whatsoever. It does discuss Gehrig’s football career at Columbia though; and we all know that concussions and Football go hand in hand. I do know that Gehrig was hit in his head more than once during his career though. In fact I have a photo saved from one of the incidents. I assume you ask because the supposed connection between ALS and concussions? Also, I think the color is a little off on that Sabo SI cover. They def wore grey uniforms for road and white at home (I believe). I have no recollection of powder blue uniforms…although my memory could be off due to a concussion. I don’t remember that particular interview, but it certainly wouldn’t be out of character for Sabo to do that, ha ha. And that is gray in his uni. Love the Reds Hot! video. Looking forward (finally!) to a great postseason for the Redlegs!